That the EFF planned to disrupt his address but decided at the last moment not to go ahead ‘showed Ramaphosa was defeating them politically’. 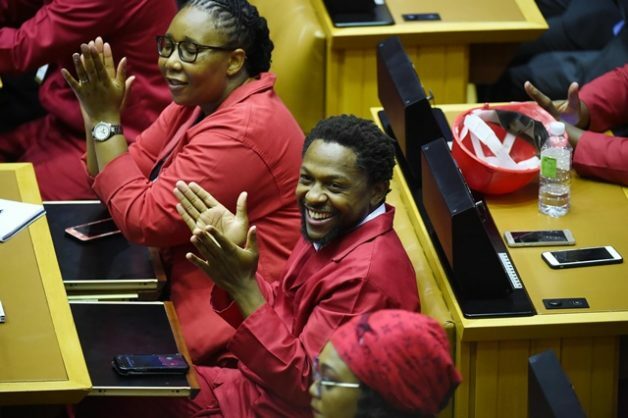 President Cyril Ramaphosa has outsmarted the EFF – and the party had to withdraw its plan to disrupt his state of the nation (Sona) address in parliament yesterday, a political analyst has said. This was indicative that the ANC was gaining traction under Ramaphosa and has stolen the thunder from the EFF on significant policy issues – something he has been doing since he came to power last year. Lawrence Hamilton, SARCHI/Newton Research professor in political theory at Wits and Cambridge universities, said that the party planned to disrupt his address but decided at the last moment not to go ahead showed Ramaphosa was defeating them politically. “It was a very savvy move. Ramaphosa is successfully taking the window away from the EFF and moving it to the ANC. He has been taking things such as the debate on land reform away from them,” Hamilton said. Another analyst, Ralph Mathekga, said the EFF’s disruption plan was unwarranted and part of attention-seeking. “The man (Ramaphosa) is trying by all means. Such disruption would have been unjustified and exposed the EFF as being irrelevant. “It’s not their stage, it’s the president’s stage. They have realised it’s not going to work and called it off,” Mathekga said. The EFF demanded Ramaphosa must admit he lied to parliament when he said earlier this year the R500,000 paid by Bosasa boss Gavin Watson was a payment to his son, Andile, after he did a consultancy work for Bosasa. The president later withdrew the statement, saying the payment was a donation towards his ANC presidential campaign prior to Nasrec and was made without his knowledge. Political analyst Zamikhaya Maseti said the EFF’s latest strategy to fight Ramaphosa over the Bosasa allegations was hollow because the party has its own sins to answer for. Reacting to Ramaphosa’s Sona, Hamilton commended him for his “very bold and optimistic” set of proposals on economic growth, job creation and massive progress on investments. His economic growth initiatives, along with the gas and oil discoveries in South Africa were a cherry on top for the president.